The Barrow Group (TBG) is recognized as one of New York City’s premier training destinations for acting and storytelling. TBG offers world-class performing arts residencies, using a performance style that encourages simplicity, clarity, and spontaneity. Our work is inspired by stories that are simple, intimate, powerful, and character driven – because we believe audiences are hungry for this kind of storytelling. We encourage students to recognize, analyze and share well-told stories which enlighten, inspire, foster community. We believe such work generates a vital artist-audience connection that gives them both an unforgettable experience. Our residencies impart training for the self-empowerment of future arts professionals and sparks the passions of students. 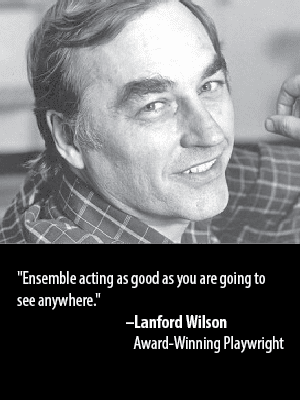 We offer residencies in acting, directing, playwriting, and filmmaking. Our residencies have meaningful impact on students eager to expand their talents with easy-to-understand techniques that encourage spontaneous and lively performance onstage. Our mentors are experienced in providing a supportive working environment for students of all backgrounds with a wide range of previous theatre training. Currently, TBG is in residency with Quinnipiac University and their New Play Festival. Residency options can be on-site at TBG or off-site at your location and can include: weekend workshops, 3 day, 1 week, or more. Acting classes and improv activities aren’t just for aspiring actors. Executives, public speakers, and many other professionals can benefit from theater training. For more information please contact Farrah Crane at farrah@barrowgroup.org.